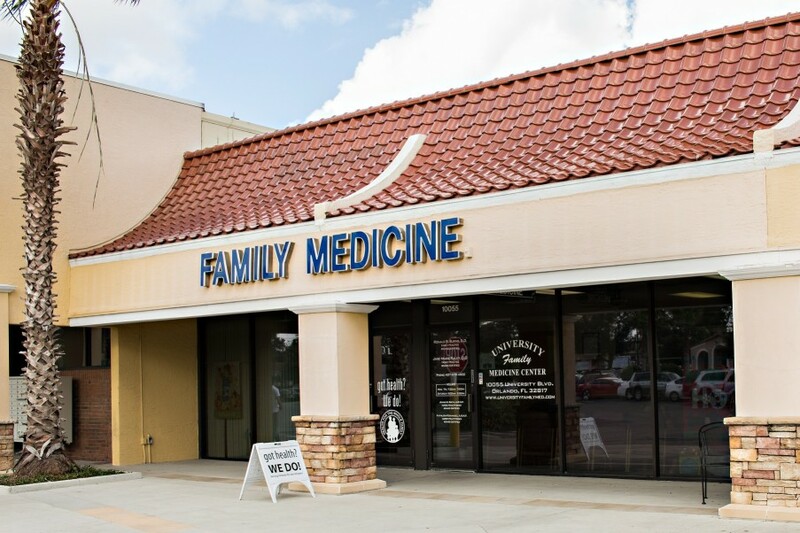 At University Family Medicine Center, we are dedicated to providing our patients with the best healthcare because we value your health! We offer same day appointments, as well as late evenings and weekends! We have some of the most comparable safe-pay rates in Central Florida! It's been made our mission to provide reliable service for you and your family with any of your health concerns. Our courteous, professional team is able to provide different ranges of options during your time of need. We offer referral lists for all of the specialists we trust the most to take care of our patient's health. Get to know more about Dr. Ronald Burns, Dr. Jane Marie Raley, & Nurse Practitioners Kathleen Davis and Sarah Richmond here. Our doctors and nurse practitioners are very flexible! If you're sick or need to discuss health options, we're here to help! We don't want you to go to sleep worrying about your health, so we offer same day appointments. Call now at (407)- 679- 4800 and we'll squeeze you in! Physical exams are a must every year as they help us keep an eye on what's happening to your body and provide prevention against disease. We would love to be your primary care physician! We even offer self-pay rates that are extremely comparable! For more info on those rates, click here. Let us look at it first! If we can send you to a specialist and avoid an emergency room visit, you will save money, prevent excessive testing, and get more timely care. We have great specialists that usually work our patients in the same day. The specialists we refer our patients to are the most trusted by our doctors at UFMC! Note: An annual examination does not include any treatments for the patient. Prescriptions and refills of medications are considered as treatments and must be coded as an examination. Most annual physicals are paid in full by the insurance company; however treatment/exams must be coded accordingly and may require a co-pay amount to be paid when done simultaneously with the physical. Check out the rest of our services on Our Services page! Click the button below to access our new patient paperwork. Please fill out all three forms at your earliest convenience and bring them to your first visit! Thank you! Please keep in mind Florida does not allow telemedicine. If you have a medical question, please call the office at (407) 679- 4800. Optifast is a medically supervised weight management program that closely monitors and accesses progress towards better health and emotional well-being.